Superman is dead. His power is not. Heroes have risen to fill the void left by the last son of Krypton. Heroes such as John Steel and Lex Luthor. Lex Luthor?!! Look! Up in the sky! It’s a bird! It’s a plane! No, its…Superwoman?!! Yes!! 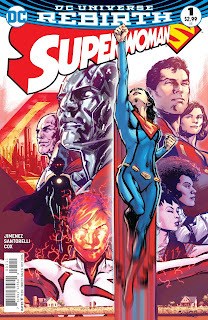 Verdict: As part of DC Comics Rebirth relaunch, Superwoman #1 is a chance to get on board to a comic from its inception rather than jumping in mid-series to an already long-published title. Writer and artist Phil Jiminez pens intimately human characters, who face some of the same doubts and fears and possess some of the same confidence and courage we all do in our lives. For me, his artwork brings to mind another great artist, Neal Adams, famed for his work on Green Lantern and Batman. Those stories also often examined the human frailties within our heroes, just as Jiminez’s does. If you could only read one title this month, this one should be it!